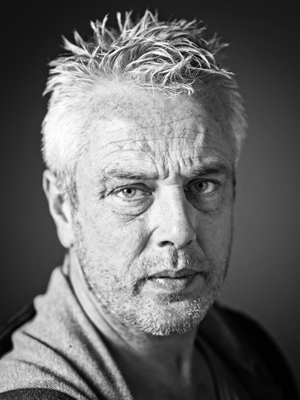 On the 18th of May 2016 Pim Vuik passed away at the age of 53, due to a brain tumor. His wife Katy now continues Pim’s tidal pool series in loving memory and in honour of his work. At some point in the 1980s, Dutch television broadcast an advertisement for pizzas starring a young trainee pizza baker. This is Mario, says the head chef, introducing him to the viewers. Iglo”s new pizza specialist. He has to start at the bottom. With the base. With none of the humility that one might have expected from a young apprentice, Mario boldly declares: Pizza basea, ees oftena cardboard. Shocked, the chef stares into the camera. I makea thata basea fantastica crostini, announces Mario with growing self-confidence. Ifa the basea isa more delicious, wholea pizza isa more delicious. He offers the chef a bite to taste. Although the chef delivers the poker-faced verdict Not bad, admiration and envy are written all over his face. The ambitious Mario prompts spontaneous comparisons with Pim Vuik. He too started life at the bottom, working in the dark room of a photography shop, developing and printing negatives. It awoke in him a desire to take up the camera and master it. He registered at the School of Photography and Photonics in The Hague and started applying what he learnt there while still a student. By the time he had set up business as an advertising photographer, Vuik had gained experience in every part of his field, from portraits and weddings to press and travel photography; he had captured images of everything from architecture to sport. In each case, he had started at the bottom and worked his way up. One thing is clear: Pim Vuik wont allow anyone to put him in a pigeon-hole. Literally as well as figuratively, since he prefers to make his photographs outside. Using the world as his studio. For one of his own series as an independent artist, Vuik ventured into the vast, snow-covered plains of Spitsbergen, near the North Pole. Where snow and ice end and the sky begins, scarcely anything is visible with the naked eye. That monotonous vastness resembles a photographic studio surrounded by a panoramic built horizon, a studio like the inside of an eggshell, in which floor, walls and ceiling coalesce in rounded arches. Since there are no corners anywhere, the studio dissolves into near-invisibility. The effect is one of disorientation. On the one hand, a white space of this kind has a certain familiarity to the photographer, while on the other hand it poses a challenge. Perhaps that was the root of his fascination with Spitsbergen. A place like a studio, but one of gigantic proportions. For Vuik, this landscape was a new test, inviting him to push back the limits of his art. Once this is understood, it makes perfect sense that Pim Vuik has turned his attention to tidal pools. These are pools along rocky coasts, in which a quantity of seawater remains at low tide. At high tide these shallow pools are flooded, while at low tide, the water is trapped in lower-lying areas. Sometimes people build barriers, walls of brick or concrete, or piles of rocks, to stop the water flowing back into the sea, creating a natural pool. Vuik has photographed many of these pools in Australia, Scotland, Portugal, Spain, South Africa and Britain. An intriguing mixture of unspoiled nature and urbanisation, of wilderness and civilisation. Water captured from the sea, which is forcefully recaptured in storms and spring tides. The eternal struggle between humankind and water. The sea that will never be susceptible to coercion. Any more than Vuik will let himself be stuck in a pigeon hole. Vuik”s trademark is unmistakeable: he refuses to accept any limitations. After all, boundaries are there to be crossed. So Pim Vuik is working on a non-commissioned oeuvre that has gradually grown to embrace the entire planet. Not bad for someone who started work in the dark room of a common-or-garden photography shop.